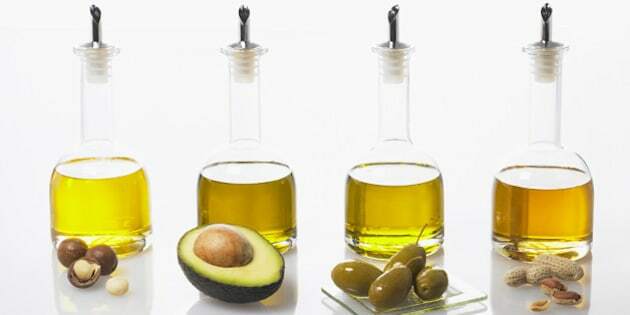 Monounsaturated Fats - foods and their oils that make up healthy fats. If you’ve taken a stroll down the oil aisle at the grocery store, you’ve probably noticed how out of control it’s become recently. Today, there are so many options for cooking, it’s almost overwhelming. But when it comes to selecting the right oil for your dish, it’s not just about whether the oil is healthy or not, it’s also about how healthy it stays after cooking. Luckily, we’ve simplified the matter by outlining the best oils for your health and the best ways to enjoy them. Before we get into specifics, though, let’s address the whole fat debate. The truth is, you need a little fat and oil in your diet. They provide essential fatty acids for your body and the health of your heart. Plus, they add tons of flavour to your dishes. The key is choosing the right fats to benefit your health. As you might already know, unsaturated fats are the good fats. They help to lower levels of bad cholesterol and increase the levels of good cholesterol. They generally include polyunsaturated fats, otherwise known as omega-3 and omega-6 fatty acids, essential for heart health, and monounsaturated fats, high in vitamin E. So let's take a look at what that means for oils. What makes it good: A great source of monounsaturated fat and antioxidants called polyphenols, which have been linked to heart health. It also has a wonderful flavour. How to use it: Avoid using it for high-heat cooking since it tends to burn. Instead, enjoy its rich flavour by drizzling it on salads or steamed veggies, or use it to sauté vegetables. It’s also a great replacement for butter in baking. What makes it good: Its neutral flavour and high smoke point make it great for high temperature cooking like frying or grilling. It has a high level of alpha-linolenic acid, an omega-3 that helps keep your heart healthy. How to use it: Canola oil can be used for almost anything – sautéing, roasting, baking, frying and salad dressings. *Did you know - canola is actually a cousin of the Brussels sprout (they are both part of the mustard family). What makes it good: High in antioxidants, sesame oil is great for adding flavour to sauces and dressings. It has a high smoke point, which makes it perfect for frying and stir fries. How to use it: Delicious in sauces and dips. It can also be used to add flavour to stir fries and any Asian-inspired dish. What makes it good: Great for the heart, this oil is made from pressed avocados and is more than 50 per cent monounsaturated. How to use it: A delicious addition to salads. It’s also a great option to sauté fish, chicken and sweet potatoes. What makes it good: One of the best choices when it comes to cooking at high temperatures. It’s rich in fatty acids, which can help improve cholesterol and kill bacteria. It’s also been known to boost your metabolism and help you feel fuller, longer. How to use it: Great for baking, it’s also delicious on popcorn! What makes it good: Known as an anticholesterol, corn oil is also a great source of omega-6, which promotes proper functioning of the kidneys, liver, heart, and reproductive and digestive systems. How to use it: Its high smoke point makes it a great option for deep frying. It’s also a wonderful addition to salad dressings and dips, and works well with flavours like garlic and peppers. What makes it good: A good source of essential fatty acids, vitamin E and antioxidant compounds. It’s great for the heart, benefits those with diabetes, provides relief for those with arthritis and help to lessen damage from free radicals. How to use it: Grapeseed oil dresses up salads and raw veggies deliciously. It can also be added to dips, sauces and salsas, and is decadent when mixed with garlic and basil, then drizzled on toasted bread. What makes it good: High in monounsaturated fats, peanut oil is very heart friendly. In fact, it’s considered one of the healthiest cooking oils. It’s a source of resveratrol (an antioxidant known to fight cancer), vitamin E (great for the skin) and is high in monounsaturated fats (great for the heart). How to use it: A superior choice for frying, light sautéing and stir fries.